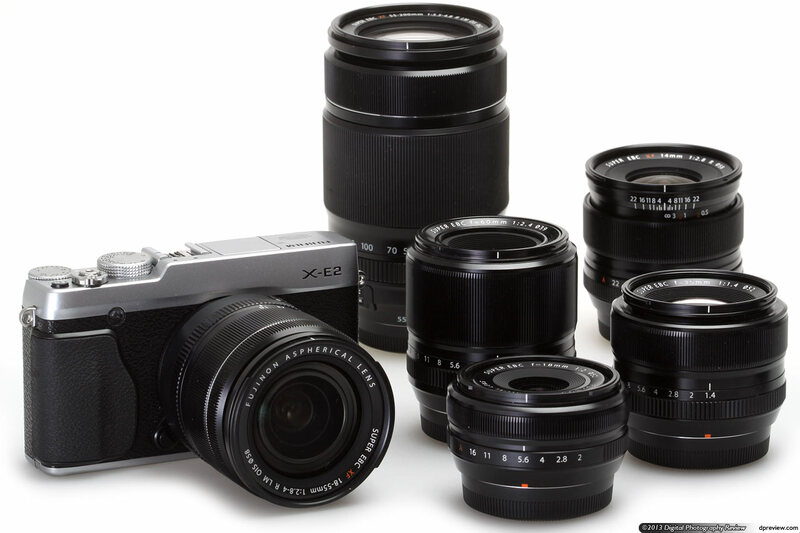 The X-E2 is the mid-range model in Fujifilm's X system of mirrorless interchangeable lens cameras, sitting between the relatively affordable X-M1 and X-A1 twins, and the unashamedly high-end X-Pro1 and X-T1. It's an update of the X-E1, which we liked a lot for its combination of 'old school' handling and excellent image quality, giving it our Gold award in our review. 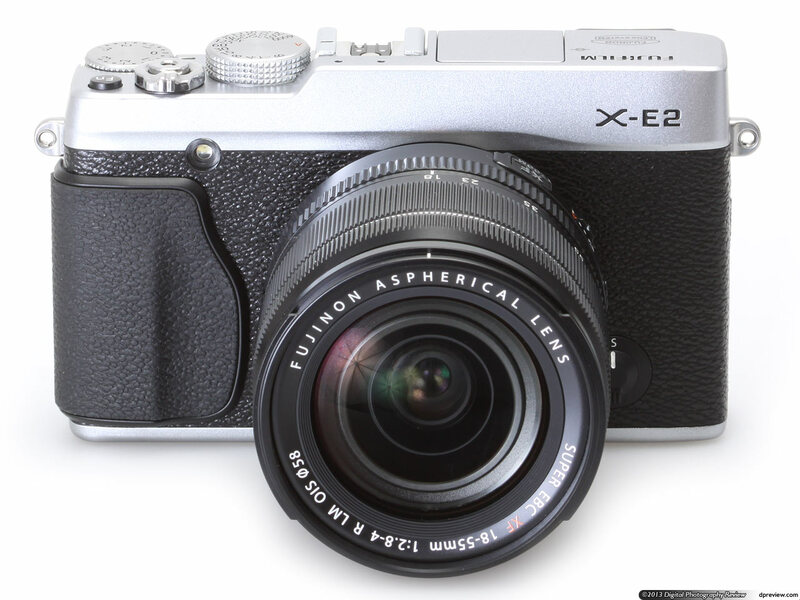 The X-E2 is superficially very similar to the X-E1, with the same basic body design and control layout; at a quick glance it's almost impossible to tell them apart. It keeps the same top-plate layout, including analogue shutter speed and exposure compensation dials, and has the same 2.36M dot OLED electronic viewfinder. The rear of the camera is still covered in buttons in much the same places as the X-E1, but their functions have been rearranged. 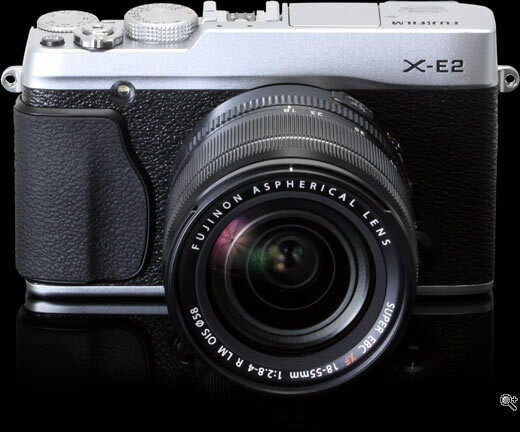 The headline updates are the sensor and processor: the X-E2 sports the same X-Trans CMOS II sensor as we first saw in the X100S, which includes on-chip phase detection elements for autofocus, and in concert with the EXR Processor II promises much improved autofocus speed. It also gains Fujifilm's rather basic but easy-to-use Wi-Fi system for sharing images. There's also a much nicer rear screen: a 3", 1.04M dot 3:2 aspect ratio unit, and a whole host of further tweaks and improvements. The net result is a camera that retains all the best bits of its predecessor, but has also been improved in many respects. Alongside the most obvious changes, the X-E2 adds a wide array of improvements and refinements compared to the X-E1, including a sensibly-revised control layout. The top-plate shutter speed and exposure compensation dials have been tweaked, with the latter now offering a range of +/-3 stops in 1/3 stop increments. Instead of a combined AE-L/AF-L button the X-E2 has separate controls for each, whose behavior can be user-defined. The rear plate controls have been rearranged, and four buttons are now user-customizable. There's also a number of small changes in response to user feedback, including the ability to specify a minimum shutter speed for Auto ISO, and live view exposure preview in manual exposure mode. The back of X-E2 is slightly rearranged compared to the X-E1 (right), with some of the the buttons serving different functions. It's dominated by the 3" 3:2 1.04M dot screen - a big improvement over the X-E1's 2.8" 4:3 420k dot LCD. The result may not be enough to tempt existing X-E1 owners to trade in their year-old cameras and upgrade, but that's not necessarily the point. In general, the days when photo enthusiasts could expect significant advances in speed and image quality with each year's new model are long gone. Instead the X-E2 is designed to keep the line up-to-date against the current competition, to draw new users into the system, and it does that pretty well. Impressively, Fujifilm has extended many of the firmware-based improvements to X-E1 customers - the company seems determined to be seen to support its existing customers. The list below summarizes changes relative to the X-E1 - some more significant than others (Fujifilm says there are more than 60 in total). Many of these reflect users' requests for operational changes and new features; some of them count more as bug fixes than anything else. But Fujifilm has to be given huge credit for listening and actively responding to such feedback. At launch, Fujifilm proudly claimed that the X-E2 offers the 'world's fastest autofocus' of 0.08 sec - an attention-grabbing statement designed to dispel the reputation the X system gained in its early days for slowish performance. The small print is revealing though - Fujifilm's tests used the XF 14mm F2.8R wideangle lens and the camera's 'High Performance' mode, which is disabled by default and has to be turned on in the menus. As tends to be the way with these things, you're not quite going to see that speed in day-to-day shooting. The X-E2's tracking autofocus is substantially improved too - on paper at least. With the camera in its 3fps 'Continuous Low' speed and the focus switch set to AF-C, the camera can re-focus between frames, and show a live view display too. The focus point for AF-C is no longer limited to the centre of the frame, but can be moved around freely. Strangely though the live view feed doesn't show up during continuous shooting in other focus modes - the camera plays back your just-taken shots between frames instead. The X-E2 is Fujifilm's first interchangeable-lens camera to offer its 'Lens Modulation Optimizer', as previously seen on the X100S and X20. This uses Fujifilm's knowledge of each lens's characteristics to adjust the in-camera processing and sharpening, in an attempt to combat diffraction and lens aberrations. The idea is to give sharper out-of-camera JPEGs when shooting at large or small apertures. The concept isn't exactly new - Raw developers such as DxO Optics Pro and Canon Digital Photo Pro do much the same thing - but it's only just starting to find its way into in-camera JPEG processing engines. 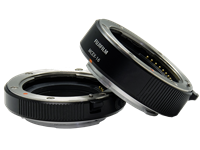 The Lens Modulation Optimizer function is compatible with all of Fujifilm's X-mount lenses, although it appears the camera firmware will need updating when new lenses are launched to fully understand their characteristics. It can be turned on or off in the menu, so you don't have to use it all the time if you don't want to, and it can also be applied to individual images during in-camera Raw conversion. The X-E2's movie mode still feels like something of an afterthought on what is primarily a stills camera (there's no record button, so it's accessed as a drive mode), but Fujifilm has added some extra capabilities. It's now possible to choose a Film Simulation mode, and adjust exposure compensation during recording. You also get a choice of framerates, but this is limited to 30fps or 60fps. The X-E2 uses Fujifilm's X-Trans CMOS II sensor, which employs a novel color filter array to suppress color moiré. This in turn means it doesn't need an anti-aliasing filter, and can therefore (in principle) offer higher resolution compared to other cameras with the same 16MP pixel count but conventional Bayer-type sensors. You can read more about the technology behind this in our in-depth review of the X-Pro1. When the X-Trans CMOS sensor it first appeared, third-party Raw support was patchy at best, with even the mainstream converters struggling to deliver sharp, artefact-free results. Since then, though, much has changed, and recently we've both seen a wider variety of choices, and a general improvement in results. Most recently, in a hugely welcome development, Adobe has started to add support for Fujifilm's Film Simulation modes. The X-E2's sensor also includes phase detection pixels to assist autofocus, as previously seen on the X100S. There are 86,000 of these all told, arranged across 36% of the sensor's area in the centre of the frame. The X-E2 is available in a choice of silver and black finishes, either body only at a list price of $999 / £799.99 or bundled with the premium XF 18-55mm F2.8-4R LM OIS zoom for $1399 / £1199.99. These are the same as the X-E1 at launch. Glad to hear that the XE-2 got new FW update, but too bad my one is long gone, I 'return' to DSLR because of the poor (sorry !) handling of the Fuji, the button layout and manual design made me very tired operating it compare to a conventional DSLR, and lack of a usable grip, even with leather case the camera is still too small and too hard to hold steady and comfortably even with my small hands... I hope the new FW can fix half of the problem, and I will seriously considering to 'come back' for another try when I've the fund, I missed so much the excellent low light IQ of the Xtrans sensor. I am happy to know that Fuji did listen to us, at least here in DP that some of the improvement on the new FW fixed my complaint about the camera. dpreview should make additional X-E2 review because X-E2 with new 4.0 FW is a new cam. I do not think theres is another cam that was so greatly improved via FW. "We'll be publishing a separate article about the full consequence of these settings for Raw shooters and when you should use the DR modes, in the coming days. " Anyone know where that article is? Wow, I hadn't realised it's been so long. I ended up binning my original draft, but I do still hope to write something. Ok, so that took slightly longer than expected. But here's the article I promised. Does the film simulation capability (Velvia, Provia, Astia etc) help significantly when moving from one subject type to another? I'm thinking specifically about you review comments concerning skin tones - and other reviews of the XE2, which have suggested that outdoor landscape photos taken with Fuji cameras do not have such vibrant color when compared to rival offerings. I purchased a Fuji X-E2 + 18-55mm kit lens in March 2015. My first test photos revealed that the lower left and right corner were blurred which usually indicates a decentered lens element or group. I returned the lens for repair. When it came back, the lower left corner had improved but the lower right corner had become even worse. I returned the lens for repair again (Fuji refused to exchange the lens). Afterwards, the lens error was still visible but had been reduced to a tolerable level. Then I took the camera on a 3-week vacation trip. Surprise: After one week, the camera body suddenly stopped working for no obvious reason (EVF and LCD monitor remained black after turning the camera on). Now I'm sending it back to Fuji for the next repair attempt. Conclusion: I'm through with Fuji. They are certainly able to build good cameras but it looks as if they don't care much about quality control any more and leave the job to their customers. Received my X-E2 last week and had a few sessions with it. It has a 'good feel' to it and takes me back to the days of rangefinder cameras. It is as simple or as complex as you want it to be. Set it on manual and use the shutter speed dial(or thumbwheel if using viewfinder)and the aperture ring. An exposure scale is in the viewfinder. Or delve into the menus and explore. Love mine so far and it has got me enjoying just taking a camera out with as it is small and discreet. Great camera, great size. great built, magnificent lenses, great buy! I received my X-E2 a couple of weeks ago now. And it doesn't feel cheap or plasticky at all, as Eddy M a bit further down here claims, its actually quite solid and overall feels a little higher up the quality ladder than the E-M10 he thinks is so great. The only issues I've come across quality-wise are the rear-control dial on the camera and the aperture ring on the kit lens rotate a little too easily. Also the shutter speed and exp-comp dials while very solid in feel and rotational resistance, are very slightly tilted forward rather than completely horizontal. And when doing long exposures at night using live-view, I noticed the LCDs backlighting isn't very even, with a quite noticable dark patch in the upper-right corner. Even though when using it in any situation that isn't nearly pitch black, the backlighting unevenness isn't noticable at all. Finally the EVF even at max brightness is too dim in bright daylight. Bad eyecup design for eyeglass wearers being the cause it seems. Stalled, almost; using the moronic WIN 8.1 and IE 11, these are supposed to be up to date. Starting ~2 weeks ago I can't even view the REVIEW / PREVIEW images individually. I get one image and no thumbnail line up/slider button underneath, nothing. [Computer is practically new, virus/bug free]. Can someone advise what compatibility setting is needed to view DPReview images [last panel]? WIN XP pro/IE8 in an old desktop has no problems whatsoever. It's the cutting edge junk that's driving me up on the wall. I've ordered an X-E2 and should be receiving it over the next couple of days. I'd like to know if the electronic level is visible on the EVF too? As I read somewhere that it wasn't on the X-E1. This is important to me because I hate correcting wonky horizons in post and don't like composing photos using back panel live view. yes, level can be switched on for the evf. I've been using an Xe-2 for a few days, with a 23mm f1.4. Classic controls, logical operation, ingenious design, fine image quality, in a form that reminds me of my old film Leicas. a) I prefer to use the EVF for composing and shooting only. The rear screen is where I check exposure and focus. I'd like to be able to set an option so that the rear screen shows the shot just taken, either for a fixed-duration quick review after the shot, or just when I push the review button. Otherwise, I want it to remain OFF, the way all my other digital SLR's work. Having the rear screen always on is distracting, attracts attention, and eats battery life. I need the option to leave the rear screen OFF. b) Assuming that Fuji eventually provides (a) through a firm-ware update, there should be an option to have a decent-sized histogram displayed, either next to the review image, or as an over-lay. With these changes, especially (a), I'd be really happy. Till then, not so much. Nice for street portraits - I team the XE up with my Oly OMD. Mobile, low profile and light. Hi! Anybody know how exactly AF works in Fuji cameras? It get the AF with phase detect sensors then fine tune it with contrast detect AF? Or we have the result from PD sensors only. I'm thinking about Fuji because of it's nice primes, and I want accurate focus. 9 central Phase Detection AF points, the rest Contrast Detection. It's pretty good, but for consistently catching fast action you really need a DSLR, like a Canon 70D or 7D Mark II. I have the XE2 and I love it. Although it's not the kind of photography it's designed for, you CAN make decent sports shots if you have it in high power mode, AF-C for focussing and keep the subject covered by the AF point from the central 9. You just can't nail as many consistent shots as other cameras, like the ones I named above. The body feels cheap plasticky!!! EM10 feels solid like a tank but cheaper. I've used an E-M10 and it does have a solid body, but the control dials while quite nicely damped feel like the plastic they are and fragile, perched there on top of the camera. feels much better than the a6000 at least..
Their current models - sure. Their previous ones, most of them delivering exactly the same IQ (but, obviously, not the same AF speed)? Nope - they have excellent price/performance ratio. This is why I've gone myself for Fuji with an X-E1 double-kit (18-55 + 50-230 for 750 euros), actually. I am looking for a light and small machine to go slowly replacing the heavy canon 1d mk iv. but both suggest waiting a little longer. Not much to ask, is it? Less weight, more photo. Thinking of getting one, I checked one out at the local store and it does seem to focus reasonably quickly - especially compared to the various `"X-1" versions. Also the EVF , while taking some getting used to when coming from DSLR territory, seems to be fast enough at switching orientation when cahnging from landscape to portrait and back. what I forgot to check was the focus-recompose ability. I have never used anything but the centre Focus point on my cameras (5Dxx) and use focus -recompose for all sorts of situations, force of habit, something Ive done for decades. Please can anyone tell me - does focus -recompose and also exposure lock exist/work? I ask because this is what Im used to and really want a small 'street' camera where I can use the technique I am familiar with to get the fastest way to catch what I see. Complaints about ISO 3200 and above? Not interested. Everything is great about X-E2 apart from plastic and "waxy" high iso jpg oefrormance.... 3200-6400 images look terrible, no details, they are worse compared to X-E1. In this area X-E2 is a big dissapointment... it's is sad that Fujifilm is deaf to all pleas of many X-E2 users to solve it in new firmware. Well-known problem with Fuji jpg. Shoot RAW and you'll be fine. Too bad than Fuji doesn't offer lenses at reasonable price.. The kit lenses are more than reasonably priced. And you can always use the new, very cheap but having great IQ XC lenses on the E2. Fantastic camera! Took it to Mt Rushmore and to Devil's Tower. It begs you to shoot manual. Other than using auto focus, I thought I was back in the 60's shooting with my Electro 35 or my SR7. Most every photo was spot on. Haven't had this much fun in a long time. My daughter is a wedding photographer & she loved the weight and the simplicity of the XE-2. Used the 18-55mm and the 35mm lenses with a SanDisk Extreme Pro 95mb/s card. By the by- Got some nice action photos of my dogs running and jumping. Who says it doesn't do action well. You just have to get your mind out of auto and shoot like the 60's. I prefer Samsung, but this one isn't bad. All preference really. I'm seriously considering this camera but have one remaining concern. Looking at the studio test scene there are two patches of resolution lines that show a strange type of moire/crosshatch. These are the bottom two of the series that runs diagonally from the lower left to the upper right through the center. I haven't seen this effect on any of the sample images posted. Has anyone noticed this effect in any real world images? What lens and settings were used for the studio test scene? Well I can't be the only one who wants to take top quality stills AND top quality video, but not have to lug two separate cameras around. I would seriously consider the X-E2 for its stills capability. But as long as the video is poor then it isn't even on my selection list. Honestly though, some people use video. I'm sorry that you don't see the utility.There happens to be a large market for it, one being dominated by some of Fuji's competition (Panasonic & Sony). I admit people want to use cameras for video i just fed up it makes a dent in a cameras score because it lacks a feature or ability Cameras should have separate scores to make it fairer and easier for each buyer to see how it performs in their chosen category. I'm not sure how to respond? It's just a score, man. Cameras don't have egos, so just in case you were worried--no cameras were harmed in the making of this review ;) Seriously though, a camera isn't going to perform better for you because DPR gave it a "gold" award. If you like a camera, like it for your own reasons, not because the internet said so. I bought the X-E2 beginning this year. I had some doubts, but mostly concerning the AF. I was pretty sure about the IQ though and the 23mm 1.4 made me decide to go for it. Having experienced the camera I can say I'm really impressed with the AF! But the only thing I can complain about is the fact that on images taken beyond ISO 3200 the skin tones look unacceptably waxy. Mostly I use RAW's, but the inability to use the JPEG's when in a hurry (or sending them right away by wifi) is a bit annoying. The more so, because even with noise reduction set to the lowest it's not much better. Could someone elaborate on the inability to use a flash remotely (wireless) as claimed in this review? My x100 can fire a Fuji or YN-560II flash in "commander" mode, does the XE-2 not have this ability? Hi, X-E2 can trigger a flash unit remotely. But, unfortunately, only one small flash unit in Fuji line (I think it is the EF20) is wireless. Mine is the more powerful EF42, but it is not wireless). @MrChristopher - the X-E2 can't 'control' an external flash (setting its output), it can only trigger it. Nikon, Olympus and Canon all have systems that allow you to remotely control the output of external flashguns - that's what the X-E2 (and Fujifilm in general) is missing. The X-T1 behaves in exactly the same way, because Fujifilm simply doesn't have a wireless TTL flash system. It is the bread and butter of DPR and its members to compare cameras based upon functionality and IQ hair-splitting; and I enjoy this nearly as much as anyone because I am fascinated by cameras. 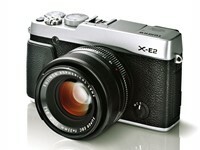 But any camera in the rough price range of the X-E2 will be a good tool in the right hands. Certainly qualitative differences do exist between cameras, and, quite appropriately, comments are made about those differences here. My concern, as an photography instructor, is that newer photographers are too influenced by minute differences in quality and performance (this not referring to things tangibly applicable in terms of proper camera types for different situations - sports, inconspicuous street work, etc.). The visceral impact of this camera or that one in an individual's hands - that subject rightness or wrongness - is going to be more important to producing quality images/art than whether in-camera noise reduction is too heavy-handed in a particular camera. Given the advantage of better perceptive skills and concepts, a photographer will generally produce more compelling work with my Samsung NX300 than others using a full frame camera of any sort. This is, of course, is widely understood by most experienced photographers (although sometimes I do wonder if it is), but such an observation should be presented periodically to those new to the media that might otherwise feel priced out of the possibility of producing excellent photography. I have seen beautiful photographs produced by a pin hole camera. I often think of the quote, "The best camera is the one you have. ", when I find myself tempted by the latest, best new models. I agree - all this hair splitting over IQ is over blown. What really matters about a camera - how quick it is to respond to user inputs - AF speed - are talked about only briefly and not really quantified in testing. For my type of shooting, I need fast AF speeds. After reading this review, I have no idea how the Fuji AF speed compares to say Nikon D7100. There is no quantitative test devised for that purpose. I personally find overexposed images from this camera, lack of details in shadows. Nikon D7100 focuses much quicker than Fuji XE2. I have both[ XE2 only 1 week]. If you need fast AF the D7100 wins hands down. I do believe the Fuji has better dynamic range and white balance. The XE2 also beats the D7100 in high ISO. Totally clean detailed files at 3200 from the Fuji. Also the black and whites are a work of art. It seems that with the advent of X-T1, the X-E2 refresh is pretty much uninteresting. One tier cheaper though. quando mi segnala il verde la messa a fuoco corrisponde , ho acquistato successivamente oltre al 18-55 il 55-200 una buona ottica, ma ho rilevato un po' di gioco nell' incastro dell'ottica nella sua sede, nel complesso sono soddisfatto. I recently purchased the fuji XE1 the quality of the picture is very good even at 3200 ISO, the focus is a bit 'slow compared to my nikon d90, when I noted the green focus is, then I bought the 18-55 over the 55-200 good optics but I found a little 'game in the' interlocking lens in place, overall I'm satisfied. It is clear the dynamic range of X-E1 is substantially better than X-E2's capturing much more shadow detail. Is there a reason for this, in your opinion? How did you determine this difference? Do you own both cameras? There is a learning curve associated with the XE2's Dynamic Range control settings, which can make a substantial difference in IQ. $$Policy$$ any tips on those settings would be appreciated. Still getting to know my X-E2 but enjoying the hell out of it. Thanks. There is no difference in dynamic range at all. There is a difference in the default tone curve used in each camera for processing JPEGs. What this has to do with dynamic range (it should actually be JPEG exposure range) I will never know. Since nearly everyone boosts contrast in post processing, Fuji merely adjusted the default tone curve to be more contrasty. You can adjust the camera many ways to offset this if you insist on shooting JPEGs. back in film days I used compact minolta http://www.amazon.com/Minolta-Freedom-Zoom-150-camera/dp/B0000AUFK7.. I wonder, how did they squeeze the full frame into tiny body with tiny lens and why its not possible with digital? Does it have an LCD screen covering most of the rear surface of the camera? Is a digital camera's sensor, including power and data connections, as thin as a piece of film? 1. It's not a dslr (and is it that smaller than the sony a7)? It's very clearly softer than the OMD-10. As is the T-X1. Compare some text, especially at higher ISO's. I'm talking JPG OOC so it's nothing to do with RAW conversion. Do you use the inferior Adobe software to post process? The RAW images looks rather soft compared with m43. m43 isn't a raw extraction process. And yes, I understand that you probably know that, but that's what you implied. When I process XE2 raws with ACR 8.4, they look plenty sharp, so I just don't understand the "inferior" thing. Suggestion: Download the raws, and process yourself with: ACR 8, PhotoNinja, and CaptureOne (skip Silkypix). I copied the test scenes of both X-E2 and D7100, and compared those in Photoshop CC, JPEG, ISO 6400. It seems to me that the Fujifilm IQ (low noise) is due to very strong processing of the images in the camera. By minor adjustments I got the Nikon images to have better IQ with respect to noise. No reason to switch from Nikon to Fuji. BTW, today's mirrorless cameras are too small for big european hands. Cameras like D7100 do have the 'right and real' size. But this is my personal opinion only. Cheers. I find it strange - the tendency to convert simple personal preference into something, seemingly more universal. No criterion could possible exist to definitively advantage one or the other of the models you mention. And this idea of an ergonomic determiner seems to ignore that humans tend to adapt quite well to different positioning of hands on tools of all sorts, regardless of the size of said hands. In the days of film, some of the most modest sized rangefinders didn't lead to a parade of claims of poor ergonomics. I thought the concept of mirrorless was the smaller size. Now when I pick up my D7100 it feels unusually heavy. The smaller size is much better for street or everyday photography. The D7100 is better for faster AF shooting like sports or wildlife. DPreview can't even afford softboxes?! Sirs, every now and then I hit a problem with my XE2 and I wonder if you saw this in your testing. Every now and then I focus on something and get the green confirmation box but the subject on which I focussed is out of focus! I've sent the camera back to Fuji and they confirmed that it was all within tolerance, but this keeps happening. Have you seen this? Any observations/suggestions? This happened just the other night when taking a shot of my wife at a restaurant across the table. I tried focussing three times in succession without moving. The whole photo was out of focus every time. Once I moved, it focussed perfectly. Don't know what to do...oh and this happens with both 18-55 kitlens and 35mm/1.4. I used to have an XE1 and never had a problem with it. I wouldn't have changed to the 2, except it was stolen. So I wouldn't say fuji clearly have a glitch per se, not on the basis of 2 reports of an issue! That sort of question is what the FORUMs are for. I'd be on the lookout for a firmware update, but according to malteser's experience with his xe1, it doesn't seem like they want to address that. Gasp! You mean there is an AF system that's not _100%_ accurate?! What is this, 1992? I had this happen when I tried a friend's X-E2 with 35mm lens on a sunny day. Then it also happened while testing out the X-A1 and the 18mm lens in a well-lit store. Tried 3 times and I always get the green dot focus confirmation but the image is clearly out of focus. Seems this is standard fare on Fuji's. It's certainly the case on my x100s. If there's something contrasty in the background (even outside the square) it'll pick it 2 out of 3 times. So when the focus is described as "fast" it's not telling the whole story. In the short time I've played with an X-T1 it appeared to exhibit the same trait. Nice camera though. Check the position of the Focus Mode Selector (8) AND that your index finger isn't interfering with the AF-assist illuminator (12). This happens in good light as well as bad. Focus mode selector is always in S.
Maybe the af area is too large? have you tried to set it the smallest possible with the thumb wheel? I'm pretty tired of Nikon's weird green color cast, I'll tell ya that. And the ugly way that highlights blow out on the human face. But I'm also being forced by clients to shoot video, and I would love to shoot with Fujis starting today but only stills/video camera that has usable autofocus at a reasonable price is the Panasonic G6. So there you have it, everyone needs a little different feature set. Take a look at Ken Rockwell's site as he has a way of adjusting the green cast out which is a common Nikon problem and which I sorted with my D600. From memory I think you step up the magenta but take a look and see because he knows his stuff and his advice is free. Why are all the Canikon fan bois running so scared over these Fuji cameras? Is it because Nikon's woeful jpeg engines and Canon's outdated sensors are developing into festering sores on the buttocks? I'd take Fuji's skin tones over the crap that Nikon cameras spit out any day. I am a Nikon shooter by the way, but just don't prescribe to this brand loyalty bs that drives so much discussion on this site. Canon = weak dynamic range and outdated sensor performance. Fuji is sure doing something right! Nikon and Canon are clinging on to their old technology. It is still just a Bayer sensor after all. I like Fuji but has your photography improved is question. It's just a device and I think it prolly hard to buy a bad camera nowadays. Photography is no longer what you can do with you camera, but what can your camera do for you, if I am judging by some peoples perspectives from their comments. Well, most of the time is it the person behind the camera that is the limiting factor. But as for DR, then our eyes are far superior still. despite the fact that the iso rating is over stated. the iso 6400 X-E2 shots still beat many other camera's iso 3200 shots. I really hope Fuji would allow Auto iso max 12800, which is more like iso 6400 for other brands. Slightly rose-tinted review IMO. I'm very surprised that the review didn't mention the lack of a dedicated Custom button as outlined in Michael Reichmann's article in LuLa. Also, surely the point of having an EVF is that you can put on the EVF a histogram and over-exposure guidance like flashing highlights so you can use EC to correct exposure while the camera is still to your eye. When they do that and add a Custom button, I'll get one. Longing to get rid of my heavy Canon DSLRs and those heavy white lenses, as most of my photography these days is while travelling! can we just agree to disagree? From the jpgs I have seen, they all look great. More absolute nonsense about how these types of controls create a stronger sense of control and require a commitment to learn photography. I got a chuckle over the silly infatuation with the dedicated exposure comp dial. Why does it make a difference? BTW, I really like the new Fuji cameras. For their portable size and image quality. Easy exposure compensation is the first thing I look for in a camera. The EC button is the most used button (apart from the shutter release of course) on my d800. In fact, EC compensation dials or buttons are prominently placed or accessible on all enthusiast/pro grade bodies. It makes a big difference for certain types of shooting. Shooting events (shows, concerts, etc.) in low light means you usually stay between 0 and -3 depending on what you shoot. Stage shots need quick reaction, and there is nothing faster than flicking your thumb left or right while composing. Or you want to get a quick silhouette shot? Flick and shoot. I understand that. What I am saying is that having a big nob right there is no simpler or quicker than what you do with your D800. In fact, it can be achieved near instantaneously with your D800 without much of a thought or movement of your finger. This camera is almost perfect for me. Gorgeous rangefinder style, oled (not sequential) high res evf, lots of physical controls, high quality fast prime lenses, great iq and dr at any iso, good af speed, decent buffer. It just have some minuses, imo: low mp count (I'd like 24+ mp for cropping), no touch screen, no native iso 100. The review directly says that JPEGs of X-E2 are inferior to those of X-Pro1 but the score comparison chart, at the end of the review, shows something different. Why is that? Jpegs is 8bit. Raw are 12,14 bits, much better tonal quality. I shot some jpeg sooc while I was in Hawaii, because I didn't want to edit. Worst camera move I did in awhile. Nice camera but I feel one flaw that was only mentioned on the "noise" page (not on the conclusion page), is actually magnified by another. Like most of the X series cameras, ISO's are overstated up to 2/3 EV (1 stop difference compared to many other cameras). But in RAW, the camera also tops out at an indicated ISO 6400. Which means that if you want to shoot RAW, compared to many other cameras, the top sensitivity is actually comparable to ISO 3200. Not exactly high in the current age, where a lot of crop cameras are already used at even higher ISO's. And while I acknowledge that users can push RAW files further themselves, choice is removed and it does affect the LV experience. #2. Fuji can push up to 3 stops up when using its in-camera RAW converter. Think they are the only ones allowing such a push in an in-camera raw conversion. It's not that there are no work arounds, the point is that simple choice was removed for unknown reasons. In A and S mode, the viewfinder will still go dark if you want to go past ISO 6400 (equiv. of about 3200...) in RAW. 'Like most of the X series cameras, ISO's are overstated up to 2/3 EV (1 stop difference compared to many other cameras)'. That was what I thought when I first tested the camera. What? Was Fuji cheating? But after testing the camera a little better and comparing it with my DSLR I found the truth is a total different story. First of all the difference between my DSLR and X-E2 is different in different situations. Sometimes it's 1 full stop, then 2/3, 1/3 and in quite some situations there is no difference at all. Nikon D5600 review: making connectivity a snap? Fujifilm has released a firmware update for its X-E2 mirrorless camera, bringing its viewfinder performance up to the standard set by the X-T1. Firmware 2.0 also adds a choice over the color of focus peaking and the ability to apply Face Detection and EVF/LCD Setting to one of the customizable buttons. A 'Suppressed Flash' option has also been added. The viewfinder now operates with a lag of just 0.005 seconds and maintains its faster refresh rate in low light. The firmware is available for download from the company's website.